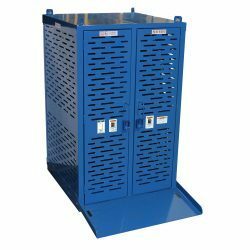 The Cylinder Storage Cage (CSC) is a heavy-duty formed and welded cage used to securely store and transport industrial cylinders, like oxygen or acetylene. The walls and door are comprised of laser-slotted metal to provide security, visibility of contents, as well as natural ventilation. The CSC can be transported by forklift. The door hinges are welded for strength and the door can be locked to prevent unauthorized access.